Do you and your buddies want to become supreme ninja masters? Of course you do! Being a ninja means you get to stand on a mountain top, play guitar, and make people’s heads explode with the sheer power of your awesomeness! The first step in the way of the ninja is to compete in the Ninja Olympics. Test your abilities in events of stealth, cunning, strength, and endurance against other ninja teams! There will be many challenging events in the Ninja Olympics that your team of three ninjas will participate in, and some even require teamwork to win. Choose your fellow ninjas wisely! The team with best harmony will be the supreme ninja masters who take the golden shuriken home to their ninja village! Not only that, the top ninja teams will win prizes provided the ninja elite of MegaCon! • Sign-ups will begin on Sunday morning at 9:30 a.m. and end at 10:50 a.m. and will be held at the Anime Sushi table by room W224. • Sign-ups are first come, first serve, and only a max of twelve teams can enter. There will be four slots for alternates in the event that a registered team fails to show up to the Ninja Olympics at the event start time. 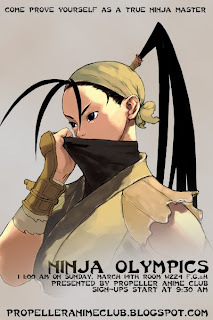 • After all events in the Ninja Olympics have ended, points for each team will be calculated and then there will be an awards ceremony for the top three teams who be presented with rewards for their victory. • Propeller Anime Club, Anime Sushi, MegaCon, and the Orange County Convention Center are NOT responsible for any injury in connection to the Ninja Olympics, or during it. • The Ninjas of the Propeller Anime Club reserve the right to disqualify any unruly or disruptive contestants and will do so without sympathy. Please be courteous and civil. • Since there is physical activity required for the events, you MUST have some basic physical fitness to compete. Can you do a push-up or sit-up? Can you walk at a faster pace for multiple city blocks? If not, then you probably shouldn’t enter the Ninja Olympics. • Make sure you stretch out before competing to prevent pulling any of your muscles or any other injury. • Make sure you are properly hydrated for the event. • Please wear proper footwear for the event. Don't wear sandals, high-heels, or go bare foot. • The event starts at 11:00 a.m. Make sure that you and your teammates are on time. • Propeller Anime Club, Anime Sushi, MegaCon, and the Orange County Convention Center will not be responsible for any lost or stolen items. Leave them at your own risk. • It’s totally cool and encouraged to come to the event dressed as a ninja. However, real ninjas do not wear orange! The Ninja Olympics will be held at MegaCon 2010 on Sunday, March 14th at 11:00 a.m. in W224 F, G, & H! Event time and location is subject to change. For more information about the Propeller Anime Club and their events at MegaCon, visit their website at http://propelleranimeclub.blogspot.com/. For more information about MegaCon 2010, visit http://www.megaconvention.com/.